I went looking for some military history or wargaming related items last weekend. 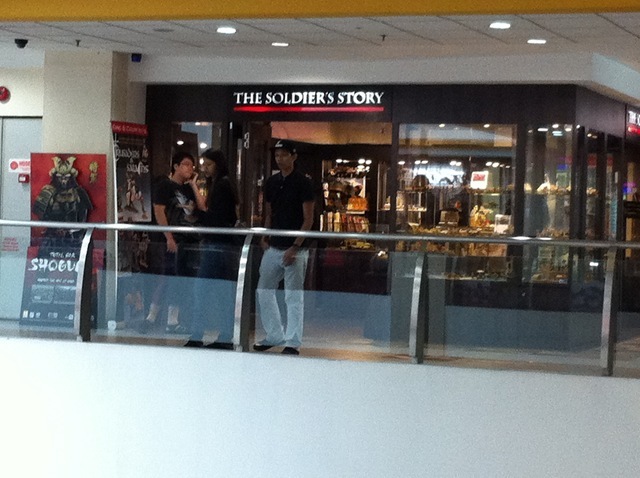 The first I had discovered was The Soldier’s Story in Funan Mall. I actually discovered it whilst sitting across from it and having a coffee (more about that in a later post). The Soldier’s Store stocks the King and Country range of collectable figures. These are definitely not wargaming figures but it was a start and I figured that they would stock something military, at least some magazines. Well, they did. Apart from the gorgeous King and Country figures, there were some Strategy and Tactics magazines as well as a general military magazine. More importantly, they pointed me in the direction of Paradigm Infinitum – see later post here. For those not familiar, the ‘#05-43’ means shop 43 on floor 5 of the building. Funan Digital Life is also a great location for those interested in things digital (technology) and contains many of the same retailers as SimLim Plaza. I can recommend a visit to the Soldier’s Story. Whatever happened to the Napnuts?